Coat racks are making a comeback. And wouldn’t you know it, we have a few! I don’t know who invented the coat rack, but historically, it has been a very handy option. Especially around houses like mine! With limited closet space in the bedrooms and hall closet, coat racks are ideal for folks like me! The accessory that Zazzle offers up to designers is built from high quality Alderwood. 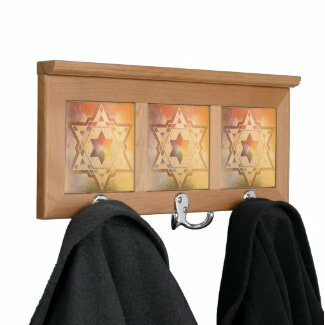 If you’re searching for a “unique” gift for someone, consider looking through my designs in the category “coat racks” in the studio. On ours, the art work is printed in full-color, full-bleed on three 4.25” white ceramic tiles. These are ideal for small spaces, such as the small house or apartment, and are very versatile. Perfect for that newly married couple moving into their first place! The dimensions for these Alderwood/Ceramic racks are 16.5” l x 7.125” w x 1.5” h. In “the old days” clothes were usually stored in trunks or armoires. Armoires are very ornate (I’ve seen some NICE ones in the local antique shops) and extremely heavy. They are also expensive and take up much more space. It’s a simple matter to install one of these wall-mounted coat racks. Two keyhole style grooves on the back of rack allows for easy hanging, even if you’re not handy with tools! All you need to do is decide which wall to use! I have one in the entryway of my house, one at the back door, and one in the bathroom! I am able to mix and match the tile variety. So, if you see three different pieces of art you like, I can include one on each tile. 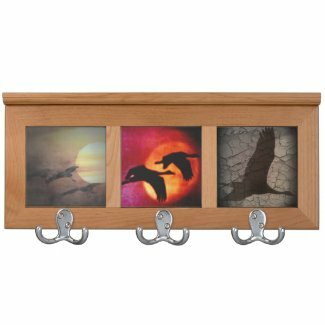 For example on the one below, I incorporated three of my Sandhill Crane pieces. MOST of the ones represented in my shop all carry the same design, BUT again, if you don’t see one here, simply let me know the names of the pieces you’d like included… And even better, if you have YOUR own images for an anniversary, or more personal gift you’d like designed, just let me know! Thanks for listening and as always YOU are appreciated! I only ask that you pass it on! Sharing my sites with others, helps! This entry was posted in Animals, anniversary gifts, Appreciation, Arizona Art, Art & Culture, Art Distribution, Art History, Auto Racing, award winning art, Baby Showers, Baseball memorbilia, Birthday Cards, Boys Town Alumni, Bridgeman Art Library, Cats, Childrens Parties, College Baseball, College World Series, Disney Products, engagement ideas, Female Portraits, Floral, Gardening, graduation gifts, housewarming gifts, interior decorating, Iris Painting, Marketing Art Work, Memories, midwestern artists, Mojave Desert, Nebraska Travel, Omaha Landmarks, Posters Cards Gifts, Print On Demand, Ragoon Arizona, retirement party, Rose Gardens, Rural, Sandhill Cranes, Sports, Spring, Summer, Sunrise Paintings, Trucker Art, Trucking, Trucking Artists, tulip gardens, vintage art, wall hangings, wedding designs, wedding gifts, wedding invitations, wedding planning, wedding postage, Western Artists and tagged Art & Culture, Baby Shower, bathroom decor, ceramic tile, children's room decor, closet space, Coat Rack, Coat racks, custom coat racks, custom floral designs, custom home decor, decorating ideas, dennis buckman, Floral, floral artists, Floral Coat Rack, floral designs, for mom, for them, foyer decor, home accessories, home remodeling, housewarming, interior decorating, interior decorting, keepsake, living space designs, man cave decor, midwestern artists, nebraska artists, newlywed, personal, personalized, personalized gifts, quilting, storage, unique christmas, wall hangings, wedding, wedding gifts. Bookmark the permalink.